We reputed for offering medical oxygen plants, which are medical oxygen production systems. Our medical oxygen plants are fabricated and manufactured using imported technology from an acclaimed Italian company. Superior technology used in our oxygen gas manufacturing make them at par with the best in the world. Our company feels proud in itself for manufacturing and supplying advanced Medical Oxygen Generator Plant. In order to make our plants to compete the plants of international standard, we manufacture them in technical collaboration with ING. L. A. Boschi of Italy. Our oxygen plants are designed and developed to meet the highest standards of performance and reliability. Since our inception in 1985 in New Delhi, we have been manufacturing and supplying Medical Oxygen Gas Plants to a number of worldwide customers spread out over 40 countries. We recruit well qualified and highly experienced engineers who have years of experience in the respective field of designing, manufacturing, installation and commissioning of all kinds plants. We are leading hospital/medical oxygen plant manufacturers that manufacture medical oxygen generating systems for hospitals and nursing homes. Our company ensures that the plant machinery is reliable, efficient, durable and high-performing. It is our endeavor to see that our medical oxygen plants meet the requirements of hospitals and various other medical and research institutions. Besides, our plant machinery is used in glass industry, pharmaceutical and medical industries, and petroleum industry and oil refinery. Our plant machinery comes in various capacities ranging from 20m3/hour to 500m3/hour. We use the latest technology and employ the best materials in the fabricating of the machinery. Oxygen generated in our machinery has no contaminants since oxygen gas /liquid is processed at cryogenic temperatures. We import the latest cutting-edge technology for fabricating and manufacturing hospital medical oxygen plant that uses stainless steel column. Manufacturing of oxygen plant for cylinder filling is finished as per EIGA (European Industrial Gas Association) standards. For strict compliance with quality standards, our medical oxygen plants for hospitals have been awarded with CE and ISO 9008:2015 certifications. Our plant ASU column is manufactured with 100% cryogenic grade stainless steel. Components used in our machinery are as per the standards of American Society for Mechanical Engineers (ASME). As our plant machinery is fabricated with 100%cryogenic grade stainless steel, it is able to produce medical grade oxygen that meet European Pharmacopeia. Capacity 20 m3/hr - 1000 m3/hr. We specialize in manufacturing and fabricating medical oxygen plant for hospitals at low pressure process of 6 to 8 bar using the technologically advanced air compressors. Our medical oxygen plants reputed for producing oxygen having bone dry quality with purity up to 99.7%, which is considered excellent for medical applications. We ensure that our hospital medical oxygen gas plant are solidly manufactured outstanding features such as low power consumption, sturdy design and easy to operate. The plant machinery is used in steel industry, health industry, metal production industry, aviation industry, and glass and ceramics industry. Our medical oxygen gas plants are offered in different capacities ranging from 20m3/hour to 500m3/hour. We use the latest cryogenic technology in the fabricating of our machinery. We also have got a modern in-house R & D unit that is engaged in manufacturing and fabricating medical oxygen plant for hospitals. We have employed highly skilled manpower which is continually innovating and fabricates hospital medical oxygen plants that are globally competitive in terms of performance and prices. Fabricating and manufacturing is done in compliance with international standards and are sold all over the world. Our medical oxygen plant is fabricated as per EIGA (European Industrial Gas Association) standards. We have been given ISO 9008:2015 and CE certifications for our compliance with international quality standards. We manufacture hospital medical oxygen generating and cylinder filling plants that are skid mounted requiring little time for installation. Fabricated using 100% cryogenic grade stainless steel, our oxygen gas manufacturing plants produce 100% medical grade oxygen meeting European and Indian Pharmacopeia. We are renowned for manufacturing and fabricating top-class psa medical oxygen filling plant for producing on-site oxygen for medical purposes. Our medical oxygen gas plants are characterized by their features like low power consumption, single electric panel, round the clock operations and numerous other features. Our company manufactures cylinder filling hospital medical oxygen gas plant using latest cutting-edge technology. Manufacturing is done in technical collaboration with an acclaimed Italian company, ING. L. & A. Boschi, which manufactures and supplies oxygen plants, oxygen gas manufacturing plants and oxygen generating plants all over the globe. High quality components are used in the manufacturing of our plant machinery. We have become the preferred choice of customers from around the world because of our commitment to quality and use of superior technology. We are reputed for placing great premium on investing a large percentage of our budget in ensuring that our psa medical oxygen filling plant are of world-class quality. Our manufacturing is considered at par with the best in the world. For strict compliance with quality control measure, we have been given ISO 9001:2008 and CE certifications. Since our establishment in 1985, we have sold over 500 medical oxygen gas plants to customers from all over the globe including Afghanistan, Iran, Iraq, Nigeria, Pakistan, UAE, Saudi Arabia, Qatar, etc. We have amazing expertise in customization of medical oxygen gas plants for Industry and hospitals exactly as per the requirements of customers. 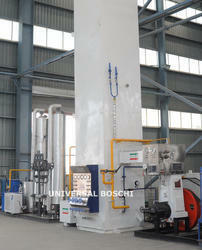 Oxygen generated in the plant has purity up to 99.9%, which meets both industrial as well as medical applications. We provide plant machinery in different capacities ranging from 20m3/hour to 1,000m3/hour. 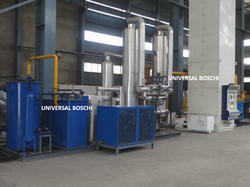 Universal Boschi manufactures and exports Oxygen Plants as the plants require low power and maintenance cost. 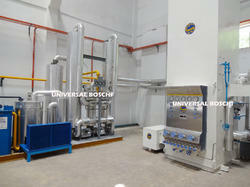 The latest UBT Series oxygen plants produce oxygen as well as nitrogen as per the requirement of our clients. We acquire technology of ING. L. A. Boschi of ITALY to add latest features in the products. Our low pressure oxygen plants find application in a number of industries from healthcare, brazing, steel to chemical industries. Besides of latest technology, we also use drawings and designs of ING. L. A. Boschi of Italy in order to make our products best in the industry. Furthermore, our products are appreciated in the engineering sector for their working efficiency, reliability and long life. The minimum life span of our plants is 30 years. To get technical information about the products, either call or email us. We are one of the best manufacturer and supplier of Hospital Oxygen Plant for medical and hospital uses. Our medical oxygen plans are fabricated and manufactured using imported technology from an acclaimed Italian company. Superior technology used in our oxygen gas manufacturing make them at par with the best in the world. Latest cutting-edge cryogenic distillation technology used in our plant machinery helps our machinery to deliver top-notch performance. Our oxygen producing plants are fully automated and are distinguished by low power consumption, low maintenance cost and yield of high purity oxygen. Since our establishment in 1985, we have been able to sell more than 500 oxygen gas cylinders to customers based in all parts of the globe. Our clients are impressed with the performance, prices and the quality of our oxygen generation and cylinder filling plants. Our machinery can generate oxygen with purity up to 99.7%. Our company offer oxygen plant machinery in different sizes and capacities ranging from 20m3/hour to 500m3/hour. Best raw material is used in the fabricating and manufacturing of oxygen gas plants. Our company manufactures and exports Medical Oxygen Plant in order to fulfill the requirement medical industry. Since the industry needs highly pure oxygen, our plants offer oxygen purity up to 99.7% perfect for the industry. 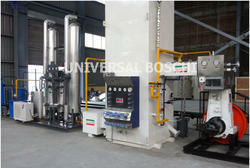 Apart from the health care industry, the medical oxygen gas plants also satiate the requirement of other industries. Being a leading manufacturer, we use raw materials taken only from a reputed and known vendor. Each item is tested carefully before being shipped to avoid any unpleasant situation at clients’ site. 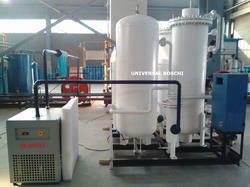 We reputed for offering high quality Medical Oxygen Gas Plant, which are industrial oxygen production systems. Our Medical gas plans are fabricated and manufactured using imported technology from an acclaimed Italian company. Superior technology used in our oxygen gas manufacturing make them at par with the best in the world. Latest cutting-edge cryogenic distillation technology used in our plant machinery helps our machinery to deliver top-notch performance. Our oxygen producing plants are fully automated and are distinguished by low power consumption, low maintenance cost and yield of high purity oxygen. Since our establishment in 1985, we have been able to sell more than 500 oxygen gas cylinders to customers based in all parts of the globe. Our clients are impressed with the performance, prices and the quality of our oxygen generation and cylinder filling plants. Our machinery can generate oxygen with purity up to 99.7%. Our company offer oxygen plant machinery in different sizes and capacities ranging from 20m3/hour to 5000m3/hour. Best raw material is used in the fabricating and manufacturing of oxygen gas plants. PSA Medical Oxygen Plant are medical oxygen generating systems that are used for production of oxygen for industrial applications. Top quality raw materials are used in the fabricating of the machinery. A well-known PSA Medical oxygen plant manufacturer is very focused on delivering high quality oxygen generation and filling plants are manufactured using the advanced cryogenic technology. This technology is widely used by the oxygen plant suppliers the world over. Cryogenic technology is based on the process cycle of Linde Claude, which was pioneered in 1930s. And, we use the latest cutting-edge technology in fabricating and manufacturing oxygen plants. The machinery built by us is reputed for its durability and reliability.